0.5% basic accuracy Large character LCD Automatic power off Water resistant Drop proof The instrument has basic dc voltage accuracy of 0.5%, a continuity buzzer, a diode check and autopoweroff feature. The automatic poweroff feature automatically turns the instrument off after 10 minutes of nonuse, either from the last use of the selector switch or the last measurement. 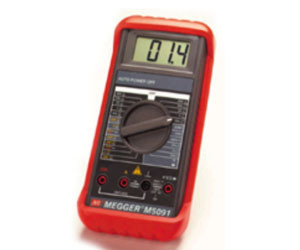 The M5097 multimeter provides advanced features for the requirements of more complex applications. The instrument features a choice of autoranging or manualranging for voltage and resistance measurements for increased measuring ranges. The LCD display features a 3 1 /2 digit display plus an analogstyle bar graph, to indicate varying readings more clearly ideal for making peak or null adjustments. The display also has annunciators for range, measurement units, polarity, overrange, lowbattery voltage, range hold, and data hold, so that the operator can easily see what type of measurements are being made.